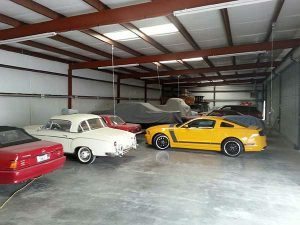 We store all kinds of vehicles at Fort Worth Car Storage: Collector car storage, classic cars, show cars, exotic cars, sports cars, project cars, trucks, and even motorcycles. If you need to store it, indoors in a climate-controlled car storage, we can accommodate you. Call us today at (817) 990-0980. Why Store a Vehicle with Us? Secure Vehicle Storage– Security is paramount for a vehicle storage facility. Our facility has a state-of-the-art alarm system and many of the features the best car dealerships use to protect vehicles in inventory. The property is secure, well lighted, fenced, and video monitored 24-7-365. You have total control of the list of people who can present ID and access your vehicle. Experienced Staff– Fort Worth Car Storage has been storing vehicles for more than 30 years. When you are leaving your baby in someone’s hands, experience matters. Our staff is composed of car guys who will treat your car with the same care that you do. Affordable Vehicle Storage Rates– Fort Worth Car Storage delivers vehicle storage that is a good value. Protect your car without breaking the bank. Ask your Fort Worth Car Storage representative for complete details. Flexible Terms– We offer several easy ways to pay for monthly storage. No hassles. A local car storage company that is easy to do business with. We even offer a discount for prepaid annual vehicle storage. Active Duty Vehicle Storage Discounts– Get a vehicle storage discount if you are a member of the armed services on active duty. While you are deployed, the last thing you want to have to worry about is your vehicle stateside. We will keep it safe and secure until you are back behind the wheel. Multi-Vehicle Storage Discounts– If you have more than one vehicle to store, be sure to ask your representative about multi-vehicle storage discounts. Premium Log Book Management– Ask about premium services like taking care of routine maintenance or periodic driving of stored vehicles, or even maintaining your log books for maintenance on a show car. Ask about onsite detailing so that your car or truck will be showroom shiny when you pick it up. Long and Short–Term Vehicle Storage – Whether you are storing a car for a year-long deployment or just for a month or two, Fort Worth Car Storage can accommodate you. Prompt and professional, our staff is ready to serve you. Call us at (817) 990-0980! No matter what kind of vehicle you are storing, Fort Worth Car Storage will make it simple. We’re car guys, and we would love to help you store your vehicles. Whether it’s a project car waiting on parts, a vintage collector car, or your daily driver at your winter place, we will be glad to store your vehicle securely and to give you the peace of mind that comes from knowing your car or truck is safely stored.